On Monday evening, President Donald Trump fired acting Attorney General Sally Yates—the Justice Department’s top official—after she refused to defend his xenophobic executive order barring entry to refugees and travelers from predominately Muslim countries. 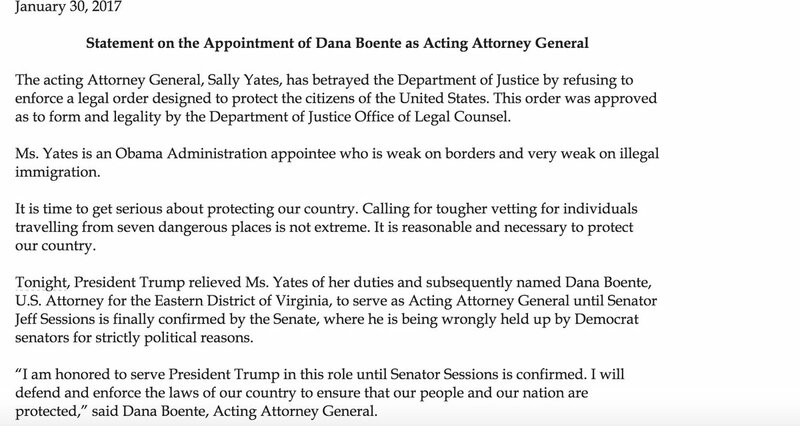 The White House announced its decision in a disturbing, almost dictatorial statement, which references Yates’s dissent as a “betrayal.” Until an official appointment is confirmed by the Senate—most likely Senator Jeff Sessions—Yates is replaced by Dana Boente, U.S. Attorney for the Eastern District of Virginia. “The acting Attorney General, Sally Yates, has betrayed the Department of Justice ﻿by refusing to enforce a legal order designed to protect the citizens of the United States. This order was approved as to form and legality by the Department of Justice Office Legal Counsel. Earlier today, Yates declared that the Justice Department would not enact Trump’s executive order, emphasizing that its legality is dubious, and its ethics indefensible. She articulated her position in a letter to Justice Department lawyers. In light of her misgivings, Yates firmly refused to enforce the order. 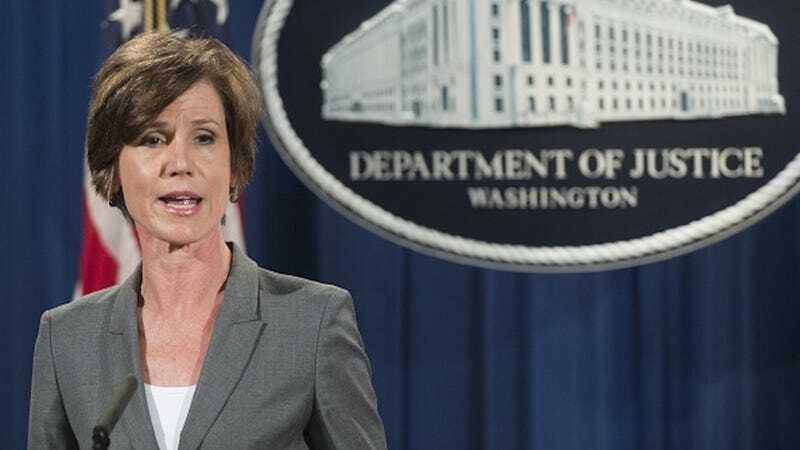 “For as long as I am the acting attorney general, the Department of Justice will not present arguments in defense of the executive order, unless and until I become convinced that it is appropriate to do so,” she averred. In 1986, Sessions was denied a position in the Reagan Administration as a U.S. District Judge because he was determined to be ideologically racist. It’s clear that whoever takes up the mantle of Attorney General will be expected to comply with Trump’s executive orders, whatever their ethical reservations. We can expect Sessions to enthusiastically support the extant travel ban, and, in the interim, Boente has already promised to do so too. Regardless of vehement protests across the nation and throughout the government, Trump is hell-bent not only on maintaining his travel ban, but also—crucially—on being obeyed. This is unsurprising, but frightening nonetheless. In the meantime, you can refer to this list of organizations working to support refugees and immigrants. They need our help more than ever.